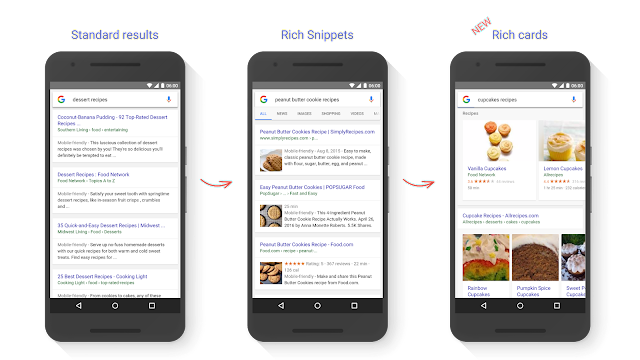 Rich cards are a new Search result format building on the success of rich snippets. Just like rich snippets, rich cards use schema.org structured markup to display content in an even more engaging and visual format, with a focus on providing a better mobile user experience. For site owners, this is a new opportunity to stand out in Search results and attract more targeted users to your page. For example, if you have a recipe site, you can build a richer preview of your content with a prominent image for each dish. This visual format helps users find what they want right away, so you’re getting users who specifically want that especially delicious cookie recipe you have. Google is starting to show rich cards for two content categories: recipes and movies. They will appear initially on mobile search results in English for google.com. Google is actively experimenting with more opportunities to provide more publishers with a rich preview of their content. Google built a comprehensive set of tools and completely updated our developer documentation to take site owners and developers from initial exploration through implementation to performance monitoring. Browse the new gallery with screenshots and code samples of each markup type. Google strongly recommends using JSON-LD in your implementation. Find out which fields are essential to mark up in order for a rich card to appear. 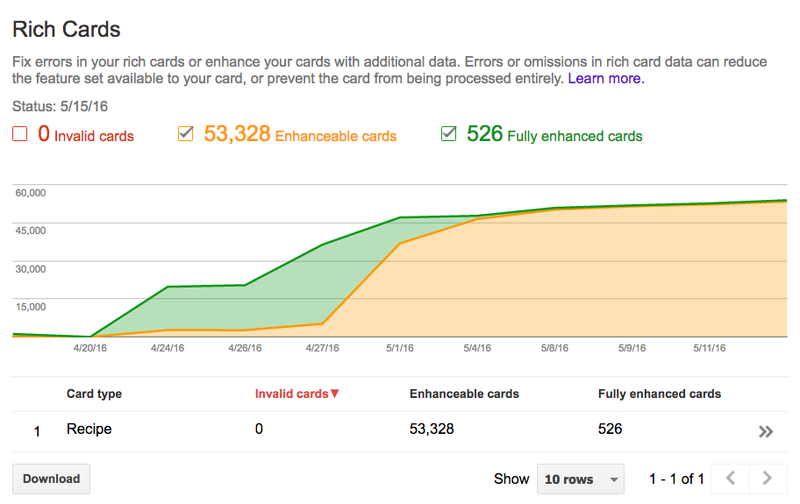 Google also listed additional fields that can enhance your rich cards. See a preview in the revamped Structured Data Testing Tool of how the rich card might appear in Search (currently available for recipes and movies). 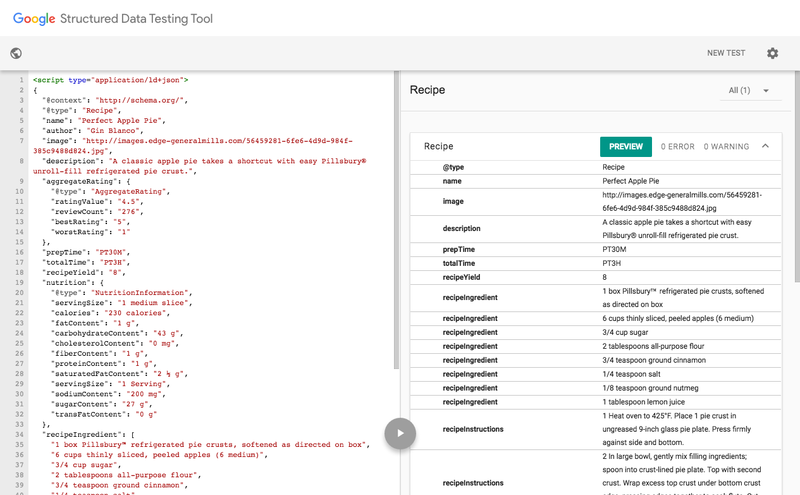 Use the the Structured Data Testing Tool to see errors as you tweak your markup in real time. 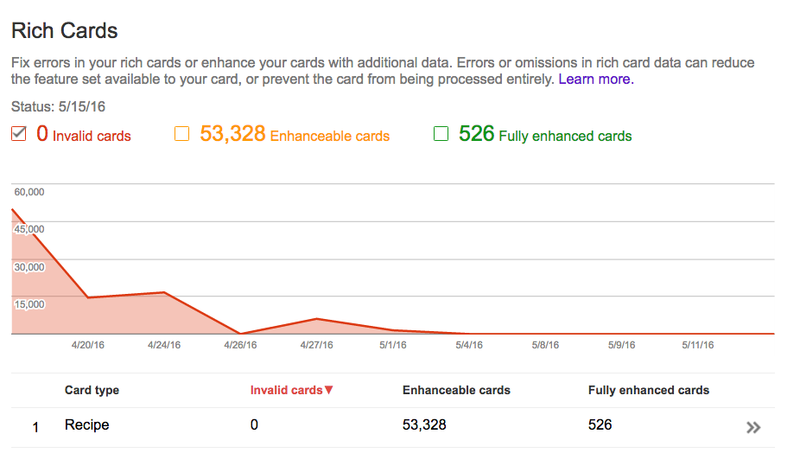 Check how many of your rich cards are indexed in the new Search Console Rich Cards report. Keep an eye out for errors (also listed in the Rich Cards report). 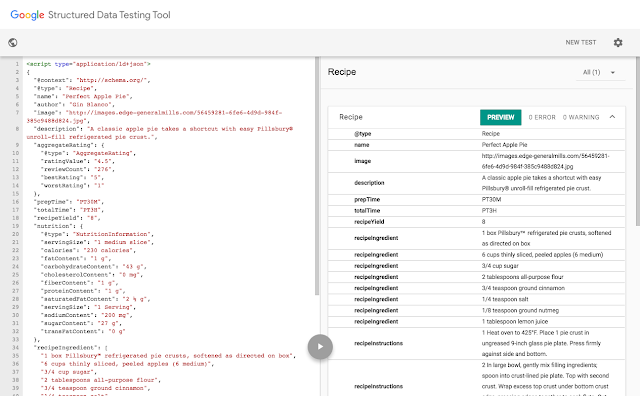 Each error example links directly to the Structured Data Testing tool so you can test it. Submit a sitemap to help us discover all your marked-up content. In the Rich Cards report, you’ll see which cards can be enhanced by marking up additional fields. A new “Rich results” filter in Search Analytics (currently in a closed beta) will help you track how your rich cards and rich snippets are doing in search: you’ll be able to drill down and see clicks and impressions for both. Q: Can I keep my existing rich snippets markup? A: Yes, you can! Google will keep you posted as the rich result ecosystem evolves. Q: What about the Structured Data report in Search Console? A: The Structured Data report will continue to show only top-level entities for the existing rich snippets (Product, Recipe, Review, Event, SoftwareApplication, Video, News article) and for any new categories (e.g., Movies). Google plans to migrate all errors from the Structured Data report into the Rich Card report. Q: What if I use the wrong markup? A: Technical and quality guidelines apply for rich cards as they do for rich snippets. Google will enforce them as before.Learn more about rich cards in the Search and the mobile content ecosystem session at Google I/O (watch the recording on YouTube) or in our developer documentation. If you have more questions, find us in the dedicated Structured data section of our forum,on Twitter or on Google+.